NEW YORK (CNS) — Time was when the biblical extravaganza was a Hollywood staple. In fact, from the silent era through the mid-1960s, it seemed a safe bet that selected slices of the best-selling volume of all time — or fictional spinoffs from it like “Ben-Hur” — translated to the screen on a large scale would yield box-office gold. Post-Beatles irony and the baby-boomer generation’s antipathy toward authority and tradition may have put that calculation to rest for a few decades. 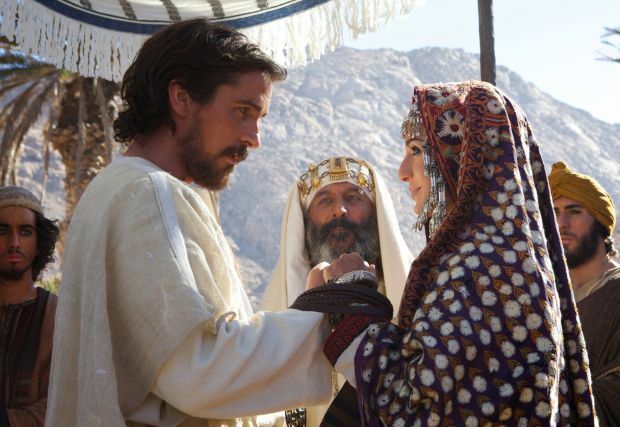 But, as earlier movie offerings from this year — ranging from “Son of God” to “Noah” — suggest, some in Tinseltown are apparently dusting off their copies of the Scriptures and taking a second look. The latest to do so is director Ridley Scott (“Gladiator,” “Kingdom of Heaven”). The bad news is that his 3-D epic “Exodus: Gods and Kings” (Fox) turns out to be big but boring. The good news is that, somewhere, Cecil B. DeMille is at ease, knowing his 1956 blockbuster “The Ten Commandments” remains the definitive mass-media take on this crucial portion of the Old Testament. Just as DeMille’s fleshing out of the story is not above satire, though (witness Billy Crystal’s hilarious channeling of Edward G. Robinson’s Dathan), so Scott’s tale is not without its promising aspects. Chief among them, for viewers of faith, is the conversion story his film introduces into the life of Moses (Christian Bale). Here, the patriarch’s series of trials and triumphs takes him from religious skeptic to true believer. Raised as a foster son to Egypt’s Pharaoh, Seti (John Turturro), and adoptive brother of Seti’s heir, Ramses (Joel Edgerton), Moses is sent into exile when Hegep (Ben Mendelsohn), a corrupt official whose wrongdoing he has uncovered, reveals his lowly origin as the child of a Hebrew slave. Working as a shepherd in Midian, Moses finds solace in married life (Maria Valverde plays his loyal, devout spouse Zipporah). But his contentment is once again disturbed when God — oddly personified by an 11-year-old boy (Isaac Andrews) — calls on him to lead his enslaved compatriots to freedom. While Scott’s picture has computer-generated effects to spare, especially in the plague scenes, its human interaction is stilted and uninvolving. Thus Moses’ potentially intriguing spiritual development is only sketched out in the dialogue, and lacks the heft that might propel the audience along on its trajectory. Additionally, the collaborative script — penned by Adam Cooper, Bill Collage, Jeffrey Caine and Steven Zaillian — is skittish where miracles are concerned and revisionist in its treatment of the relationship between Moses and the Almighty. Granted, the Moses of the Bible sometimes plays the role of advocate for the Israelites, pleading with God to spare his wayward people. But it’s nonetheless perplexing to find Scott’s main character frequently coming across as more merciful than the petulant lad who embodies his vision of the Divinity. Though it ends with the giving of the Commandments on Mount Sinai, at an intimidating running time of over two-and-a-half hours, “Exodus: Gods and Kings” may strike many as recalling more directly the 40 years of wandering in the wilderness by which the fidelity of the Hebrews was thereafter put to the test. The film contains considerable combat and other violence with some gore, religious themes requiring mature discernment as well as restrained sexual content, including a gay innuendo and two marital bedroom scenes. The Catholic News Service classification is A-III — adults. The Motion Picture Association of America rating is PG-13 — parents strongly cautioned. Some material may be inappropriate for children under 13.